This beautiful townhome is perfect for an extended stay in the Bozeman area! 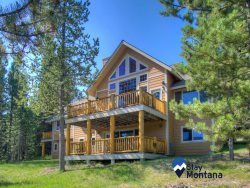 Perfectly suited with everything you need, the three bedroom and two bath town house is located in a quiet neighborhood with a great view of the Bridger Mountains. Bring your small family for a winter vacation and enjoy skiing the Bridger Bowl Ski runs during the day. At night, cuddle up with a cup of hot chocolate near the fireplace and watch a movie. The home is also equipped with WiFi and cable TV. During the summer months enjoy the endless hiking, biking, and running trails of the surrounding mountain ranges. there is a trail system located just a few yards away from the house, perfect for morning runs or evening walks! Plan a float trip down the Madison, Jefferson, or Yellowstone River and then host a BBQ on the patio in the private, fenced in back yard. This home also allows pets (no dogs over 50 pounds please)! The home itself has an open floor plan, with the kitchen separated from the dining room by a bar top counter and the living room just off the dining area. The home also has an attached one-car garage and driveway, washer and dryer, and A/C available for your use. To negotiate your stay for less than 30 days, please contact Stay Montana directly! - Private, fenced back yard perfect for pets! They were kind and understanding of our needs, and quick to respond.